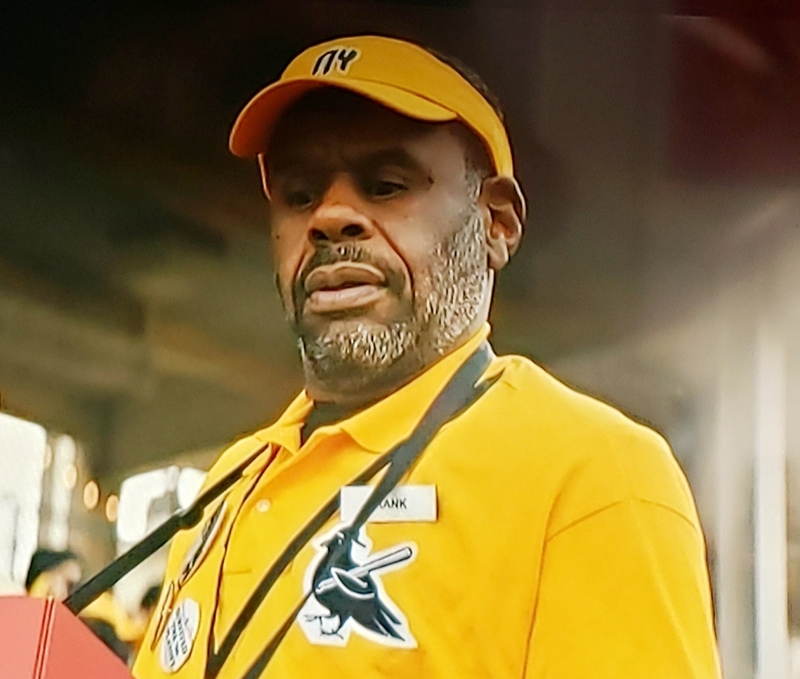 During Saturday's AAF game between Orlando and Atlanta on TNT, there was a commercial for the New York State Lottery that featured fans of a fictitious baseball team, many of whom were dressed in the team's yellow-and-black gear. Here is the establishing shot of the crowd. We can see someone wearing an unbuttoned home jersey; and, in front of that person, is the commercial's main character, who is wearing a buttoned road jersey. Both jerseys feature the same arched "New York" wordmark. Here is the main character. There are three caps pictured. The main character is wearing a black cap with an "NY" insignia. Another fan is wearing a yellow cap with the bird logo that can be seen on the left sleeve of the main character's jersey. And a vendor is wearing a yellow cap with the "NY" insignia, smartly accessorised with a yellow polo shirt bearing the bird logo. That cap can be seen on the head of a jolly face-painting fan. The fan with the yellow bird cap is wearing a black jacket that has the "NY" insignia, over a white T-shirt with the bird logo reversed. Finally, we see that the main character's jersey has the "NY" insignia on the right sleeve. We never get any indication of the team's nickname; but, considering the logo and the colour scheme, I am willing to bet that it is meant to be "Canaries". This is a quality production. Even the unorthodox choice not to have the letters of the "NY" insignia cross or interlock, as is traditional in New York baseball, was put to artistic use in the painting of the separate letters on the two cheeks of the fan. And the font, which is non-standard yet not awkwardly distorted, makes for a very attractive wordmark and initials insignia. So I say that this is very well done. That’s very unusual, to put that much work into a fictional team for a commercial. They usually pull from stock. The football uniforms from The Replacements get a lot of use, because they look very much like NFL uniforms. I’m not familiar with it, but could that be from another production? And the uniforms might be gold, but that bird is in no way a canary. That team my friend, is the Pigeons. And the uniforms might be gold, but that bird is in no way a canary. That team my friend, is the Pigeons﻿. Like Mike replaced the Clippers with the Los Angeles Knights. When done well they can be real cool. I've seen a variety of sites online dedicated to fictional teams & other sites that have a section for them. So this could be a real cool thread. This is definitely newly produced, for the New York State Lottery. There is dialogue in the commercial between the main character and his mitt. (Yes, the mitt talks.) Also, in the photo that shows the "NY" sleeve patch, we can see a lottery ticket that is about to emerge from the mitt, as it would do from a machine. So the mitt talks, and then essentially barfs out a lottery ticket. But the faulty internal logic of the scene in no way detracts from the superb design of the uniform. And﻿ the uniforms might be gold, but that bird is in no way a﻿ canary. ﻿That team my friend, is the Pigeons﻿. ...and by offering pigeon merchandise for sale. There is just no way that a yellow team could be called "Pigeons". In that case, John Thorn couldn't have employed his faulty reasoning to deny official recognition within Major League Baseball of the franchise continuity involved in the 1902 Orioles' move to New York. Oh, I know that full well. Better than most, since I was the person who first coined the name back in 2014.
is intended to be a canary. Especially when the rest of the design is, as you note, so solid. How have we gone this long without mentioning the painfully generic Miami Sharks from Any Given Sunday? Sidenote: is it me, or are all black uniforms for a Miami team a REALLY bad idea? Any Given Sunday went waaaaay out of its way to stress how not the NFL it was. Stone starts the film with a closeup shot on their fictional league logo, the script has characters explicitly mention in dialogue that they’re not the NFL, and the costume designer even worked to create uniforms that didn’t have the NFL aesthetic. That Shark uniform could never have been confused with an NFL uniform of the time, with its monochrome black over black over black. Ironic, then, that the NFL has since ditched that classic aesthetic to the point where all-black doesn’t look out of place anymore. I'm not sure the designers were terribly worried about what kind of bird it was. It just looks to me like a random bird...and it isn't yellow or gold, but black. So...crows? That would be an awesome name. But it is shaped more like a pigeon. I always enjoy high school fictional football teams. That’s too dark to be yellow. It’s pretty clearly athletic gold. Crows would have been a great choice. And that’s closer to a crow than a canary. I’m okay with that. ...and thinly-veiled homoeroticism mixed in with casual homophobia. Those two qualities, along with attempted or completed sexual assault, define 1980s teen comedies. Heathers is one of my favorite films for how thoroughly it mocks this type of movie. That’s too dark to be yellow.﻿ It’s pretty clearly athletic gold. I'm﻿ not sure the designers were terribly worried about wha﻿t kind of bird it was. It﻿ just lo﻿oks to me like a random bird. Right. There's nothing ornithological about it. It is a generic bird. The bird is black against a yellow background. But a careful examination of the crowd shot reveals the existence of yet a fourth cap: a black cap with the bird in yellow. Ladies and gentlemen, your New York Canaries. Always liked the look of the Cowboys from Little Giants. I mean, would it have killed Jerry Jones to add this to Dallas' rotation?